Teaching and training activities focus on the specific curriculum of Law students, of non-Law students with different university background and the public in general. The Chair encompasses several intensive annual courses and diverse seminars, workshops and a training course, as well as a research project. Research activities lie mainly on a research project on the EU contribution to the international environmental regulatory framework. Altogether, the Chair pairs essential and contingent learning and research-oriented activities. As for the activities’ follow-up, the Chair has its internal quality assurance system. The UB applies the ENQUA, the ANECA, and the AQU standards, procedures and guidelines. In addition, the UB Faculty of Law also has its own committee on quality assurance. This is a curricular subject for UB Law students. This course aims to understand the transformation of EU Environmental Law in the global context. This is a curricular subject for UB Law students. It aims to grant students the understanding of the evolution and main features of the Spanish and Catalan Law and the relevant influence of the Environmental EU Environmental Law. This course is part of the curricula of the URV online Master in Environmental Law. Its objective is to give students a broad knowledge of the protection of the environment and the liberalization of international trade in a global scale. This course is part of the curricula for the UB Master’s degree on Science and Integrated Management of Water, offered by the UB IdRA. The course aims to gain knowledge of the fundamental concepts of EU Law and its role in the management of water. This course is part of the curricula for the UB Master’s degree on Renewable Energy and Energy Sustainability offered by the UB Faculty of Physics. The course aims to gain knowledge of the fundamental concepts of Law and its role in the regulation and promotion of renewable energies. This course is part of the curricula of the online URV Master’s degree on Environmental Law. It aims to provide students with a detailed knowledge of the basic elements of the international climate change negotiations. The aim of this research seminar, addressed to Ph.D. candidates, is to offer an advanced understanding on how the EU responds to legal challenges related to international environmental protection. The training course, addressed mainly to judicial and legal staff and professionals, is intended to enhancing knowledge on the meaning and practical relevance of principles of EU Environmental Law for national environmental policy. The seminar aims to provide non-lawyers with the necessary knowledge about fundamental concepts of EU Law and EU Environmental Law. The workshop deeps in the skills required for research and legal analysis on the field of EU Environmental Law. The conference will explore the following areas:Coastal and near-shore biodiversity; UNCLOS and the conservation of marine biodiversity in areas beyond national jurisdiction; Ethical and legal issues related to trophy hunting; International scientific assessments and their implementation into international and domestic legal regimes; Increasing the effectiveness of protected areas. Talk in “Dret de la UE com a eina per a la defensa del medi ambient: vies de participació pública” (Dra. Mar Campins Eritja) Training activitie for the Participation in Environment Protection, Fons de Defensa Ambiental. Organized by Clínica Dret al Dret of the Law Faculty of the University of Barcelona. 22/10/2018. Talk«L’Union européenne et les négociations sur le changement climatique» (Dra. Mar Campins Eritja) ,Faculté de Droit, Université d’Ottawa, 11/9/2018. Talk «La protection international de l’environnement et le rôle de l’Union européenne» (Dra. Mar Campins Eritja), Faculté de Droit, Université d’Ottawa, 12/9/2018. Talk «Cambio climático y gobernanza ambiental en el Ártico: Retos para el Derecho Internacional» (Dra. Mar Campins Eritja) , Facultad de Derecho de la Universidad de Vigo, 6/11/2018. Participation at the Workshop “Fostering excellence in teaching and research on European health and environmental law in the framework of Jean Monnet Actions” (Dr. Xavier Fernández Pons), organized by the Jean Monnet Chair “European Health, Environmental and Food Safety Law”, Universiy of Salerno, 4/7/2018. 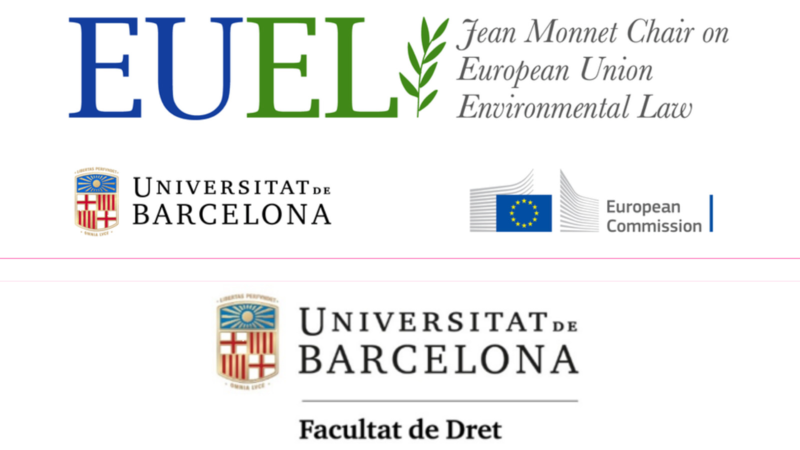 Colaboration at “Jourees d’études sur l’eau”, organized by the Law Faculty of the Universitat de Barcelona– Université Lumière Lyon 2, 17-18/9/ 2018.